Traditional Yang Style Taijiquan. The content of Single Pushing Hands: The harmony and standardization between the upper leg and the lower leg. What the upper limbs stresses is the circle which should be round and big. The strength can't be increased or decreased. Arms should be rotated inward and outward. Circle can be divided into two semicircles, four areas. Some formulas verse says: Bow in the front and empty in the back then keeps the center naturally, upward in the front and backward in the back then stands the left and right sides. Click picture for more info. Traditonal Yang styleTaijquan. 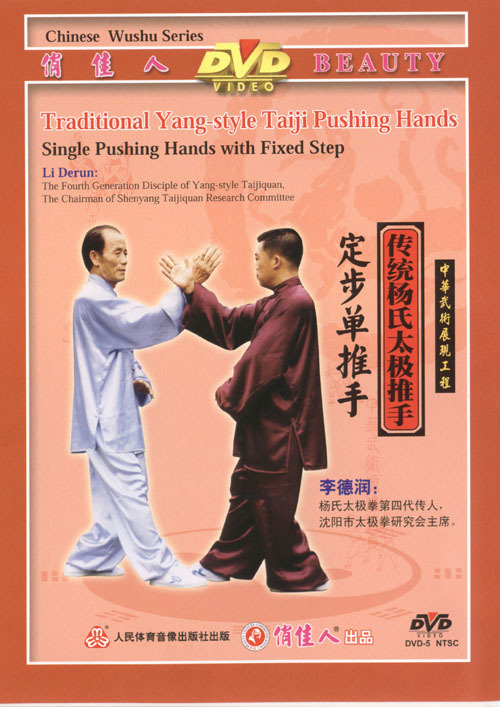 The content of Double Push Hands is: on the basis of single pushing hand, connect two arms, both hands should lead and follow. The former is leading and the latter is following. Following is to sticking, the cross-use of sticking can make the two arms keep connecting and only if you can do that then you can move freely with chest. Then your head should be raised, your neck will be upright and your hips will be lowered. And relax your chest and abdomen then make your back natural. There's a saying that: move spirally to neutralize the opponent's force by Tanzhong. Click picture for more info. 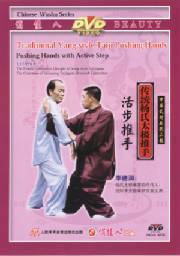 Traditional Yang style Taijiquan. 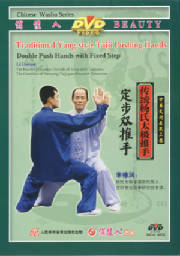 The content of Four-sides-hand with Fixed Steps: The three steps and four kinds of using force on the basic of Double Pushing Hands. The three steps are Step forward, Step backward, Step forward and backward. The four techniques of using force are about Ward-off, Rub, Press forward, Push. These are the four kinds of using force of the eight techniques. They are "Ward-off" force, "Rub" force, "Press forward" force, and "Push" force. The two persons should move with the note to embody the identification and opposition of the five elements. The formulas verse is that, one "ward-off", two "press forward", three "change hands", four "rub", five "push" then turn body. Click picture for more info. Traditional Yang Style Taijiquan. 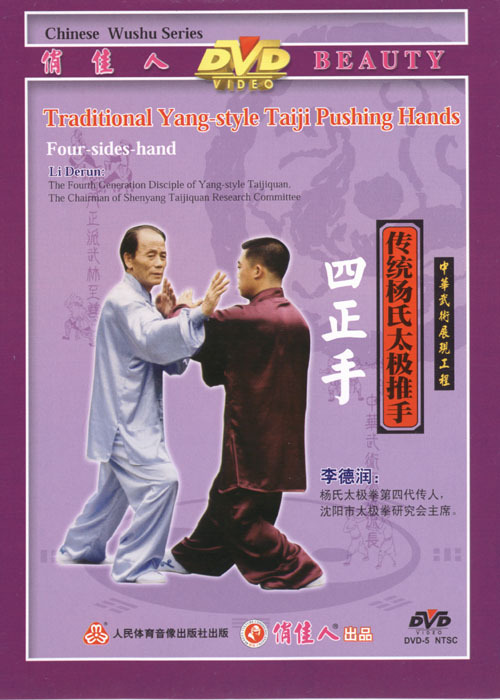 The content of Pushing Hands with Active Step: On the base of Four-sides-hands with fixed stance, it talks about the four energies of the upper limbs and the harmonious integrality of the lower limbs. The four energies embody the identification and opposition of "To adhere and lift", "To join", "To adhere horizontally", "To attach from the rear". Always keep the movement of the two persons in a whole, canonical and harmonious. Click picture for more info. 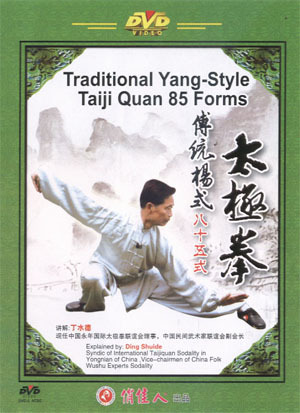 Traditional Yang-Style Taiji Quan 85 Forms is very practical. It combines dynamic with static movements, softness with firmness, like a dragon flying around. It enjoys a good reputation that the player can have a trial of strength with his opponents without touching their bodies. Click picture for more info. Yang Style Tai Chi Video Dowloads - Rent or Buy - Very Cheap!